The Most "Eye Catching" Feathers We've Ever Sold! Something Really New in Feathers! We're very excited about our new "Trueflight Bright StripesTM" feather pattern. This new pattern is a barred pattern with a BIG difference. Instead of black bars against a white or colored background, the "Bright StripesTM" have bright red or orange stripes against a white or colored background. This results in a really "eye catching", highly visible fletching -- something never before seen in arrow fletching! The Trueflight Bright StripesTM are available in Red - White, Orange - Chartreuse, Red - Pink, and Red - Orange combinations. These colors are available in all of the standard Trueflight BarredTM sizes and shapes from 4 inch through 5.75 inch, Shield Back or Round Back diecuts plus Full Length. We expect to have the Bright StripesTM in full production by December of 2005. If early interest is any indication, demand is likely to be high. You may want to order early to avoid delays. I have to say, even we have been surprised at just how bright the Bright StripesTM really are. Every time I walk by a stock box of these, I can't help but stop and say, "My these are bright! Did we do anything special to this box?" No that's just the way they look. Several people here have suggested that we really should pack a pair of sun glasses in each box! As nice as they look in the box, they look even better on arrows. Because the colors are so bright, color photo equipment has a real hard time accurately re-producing them. We're including actual samples with this newsletter so that you can see the "real thing" first hand. They are bright - but they are camo, too! For one thing the Bright StripesTM are a pretty good match for brilliant fall colors. Not autumn? Then I'd say they are "Dazzle Camo". The deer sure haven't seen any arrows with fletching like this. Heck, in the entire 12,000 year history of archery no one has seen feathers like this! Camo or not, the Bright StripesTM sure look great on an arrow. And they look different. B. C. Roemer, Trueflight's founder has been saying for 50 years that the most "eye catching" part of any arrow is the fletching. I don't think I've seen any fletching more "eye catching" than the Bright StripesTM. All kinds of wild combinations are possible. The Bright StripesTM look fine mixed with solid colors on an arrow. (And the solid colors save a bit in cost, too.) Given the numbers of solid colors, regular Trueflight BarredTM and Bright StripesTM, the number of possible combinations must be in the thousands or tens of thousands. Throw in colored arrow cresting, nock colors, shaft colors, and the number of possible variations is almost limitless. We're sure the Trueflight Bright StripesTM will be showing up on some of the most outstanding arrows ever built. We'd be very interested in seeing photos of them on your completed arrows. With your permission, we'll post as many as possible on our web site's "Examples" page. It seems every few years we see another big ad campaign letting us know that feather fletching (once again) has been made obsolete by "high tech" plastic. The latest big dollar full page color ads tell us all about the high spin rate and patented features of the new vanes. These ads sure have some nice art work and no doubt were done by some skilled advertizing executives. Plus the cost of all those big color ads probably amounts to more than the net worth of our entire company! But curiously, for all that expense and all that ad space one or two small things seems to have been left out of the ads. Things like, oh, say the weight of the vanes! (Along with arrow speed and down range trajectory.) Not even in the fine print does it mention that the 4 inch version of the new vanes weigh about 11.5 grains each. Trueflight 4 inch diecut feathers weigh 2.3 grains each. That's right - it's not a misprint. The same size "high tech" plastic weigh 400% more than Trueflight Feathers! Does that matter? Oh yes and it shows right up in the speed of the arrow in flight. 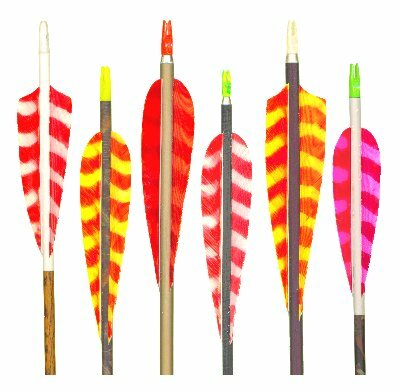 For a typical 3 fletch of 4 inch vanes or feathers, the "high tech" plastic adds at least 27 grains to the total weight of the arrow. A typical archery arrow weighs between 350 and 550 grains, or an average of 450 grains. 27 added grains is about 6% of the total weight of the arrow. Adding weight to an arrow reduces the speed of that arrow. Is this enough to worry about? We did a test with identical arrows. Each unfletched arrow weighed 357 grains. With 3 fletches, 4 inches long, the feather fletched arrow totaled 365 grains, while the plastic fletched arrow totaled 393 grains. The feather fletched arrow was choreographed at 270 fps at one yard. The plastic fletched arrow was traveling 262 fps at one yard. So... "high tech" plastic costs us 8 fps right off the bow! No amount of advertising is going to buy back that 8 fps. And the arrow can spin as fast as it wants flying down range, but no way is that spin going to speed up the flight speed of the arrow by 8 fps. No, the arrow speed will be further decreasing as it goes down range. I'm a little confused here. These plastic vanes are often recommended for use on carbon arrows. But one of the main advantages of carbon shafts is that for a given stiffness (or spine), carbon shafts generally weigh less than shafts of other materials. Less weight = higher speed = greater performance. So someone who pays extra for the light weight of carbon would than add 27+ extra grains to that arrow with "high tech" plastic vanes? "It don't seem quite right...." It's sort of like buying a Ferrari, then tying a bunch of cement blocks to the rear bumper. Maybe that's a way to avoid speeding tickets in the Ferrari, but speeding tickets don't seem to be much of a problem in archery. What about down range speed? Does the speed advantage for feathers continue down range? Yes! Independent tests by Dave Holt recently confirmed by our own tests clearly showed that the speed advantage of feathers over plastic typically continues at least to about 41 yards. The weight problem is only the beginning. Do we need to mention Feathers "fold down forgiveness", or Feathers ease of tuning, or Feathers aerodynamic "grip" or Feathers "side load stiffness"or Feathers "consistent and reliable performance in both extremely high and low temperatures"? We could go on and on and probably fill a book with photos, text and charts. We just don't have space to cover all that here. However, since we have already gone over the start of the "weight problem", there is more to this problem that we should mention. Using the "high tech" plastic adds weight to the REAR of the arrow. This is NOT a good place to add weight. Whether it's a Piper Cub, 747, Saturn V Moon Rocket, or Archery Arrow, adding weight to the tail DECREASES stability. That's really "not good"! The "FOC" of an arrow refers to it's balance point. For best stability the FOC or balance point of an arrow should be somewhat forward of the middle of the shaft. If we add 27 grains to the tail of the arrow, then we'd better add 27 (or more) grains to the point of the arrow to get the FOC or balance point back where it should be. Another words, we wind up adding a total of 54 grains (or more) to the arrow by switching to plastic! More added weight = more lost speed. But it's even worse than that. If we really want to keep "all else being equal", we need to know that adding weight to an arrow`s point and tail change the natural "bending frequency" or "dynamic spine" of that arrow. To get the effective spine back to where it was, we need a stiffer (and heavier!) shaft! More weight... again! I have to admit I have some sympathy for the plastic vane inventors. Trying to duplicate the performance of feathers or even trying to approach the performance of feathers is a tremendous problem. Maybe even an impossible problem. We've been trying ourselves for the last 50 years! It sure would be nice to have an automatic machine popping out "feather replacements" continuously, 24 hours a day with little material or labor cost. That would be heaven. Unfortunately.... neither ourselves, no anyone else has come close. In fact the closer we have studied feathers, the further from that goal we seem to be. The truth is that feathers are the "really high tech" fletching. Their structure has such fine detail you need a microscope to appreciate it. The little hooks and fibers ("natures own VelcroTM"), are smaller in diameter than a human hair. And they are all filled with air pockets almost entirely filled with air pockets. So are the rest of the feather parts! Obviously there is much more to the arrow fletching story. More photos and information is posted on our web site at www.trueflightfeathers.com/facts.htm We'd also be happy to send a printed version called "Feather Facts" upon request. Once again it is my pleasure to share with you some thoughts and happenings of the past year. Like all of you we are looking forward to some exciting but relaxing times in the woods with family and friends. The "National Archery in the Schools" program seems to be gaining momentum throughout the US. Here in Wisconsin we jumped on the bandwagon and are recruiting and training instructors. This program is a real hope for the future, making it a worthwhile investment for all of us. Wisconsin to date is still seeing lower numbers of new and upcoming hunters, and this is not good. This generation of parents unfortunately is not passing on hunting or fishing skills to their children. In times past it seemed that if dad and grandpa hunted or fished the younger ones in the family were automatically involved in the outdoor scene. The new generation tends not to be as familiar with the outdoors, much less archery. We need to change this for the better, and one way this can happen take the time to show the young folks the "ways of the woods" and the thrill (and discipline) of archery whenever we can. How about the new outdoor surveillance cameras? My son, Jacob and I had an exciting hunting season last year with our digital camera. We started using it last year for preseason bear baiting. Just imagine how exciting it was for us to see our first images of a black bear at our bait station. It only got better as the hunting season progressed. If you decide to use a camera like this in bear country, it would be advisable to put a metal box around it for added protection. Mr. and/or Mrs. Bear are very curious critters, as we well found out by the scratches on our protective metal box, and VERY close-up pictures! We got an interesting series of pictures showing the bear eating, sleeping, then waking up and walking off, minutes before I showed up with his next meal! Now that was exciting! A lot of the images are recorded after legal hunting hours but it still lets us know what is in the woods. Plus, at the end of the season, you will have a treasure of wildlife photos to share with others. This past September, at our annual Wisconsin Bowhunters Neceedah shoot I had the honor and privilege to work with what I consider one of Archery's leading authorities. A good friend of mine, and one fine man, Norb Mullaney. 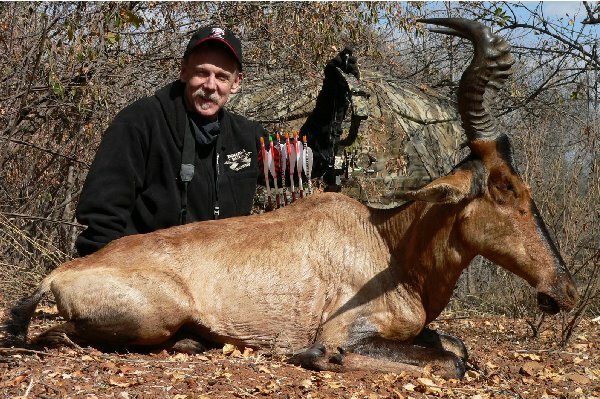 He has been with WBH for many, many years and is the technical editor for an Archery Magazine. What he does at the Neceedah shoot is to provide a service to any archer who wants to find out how his bow is preforming. He records information such as the bow model, it's draw length, arrow weight and type, then carefully measures and calculates this information before arrow are shot through the chronograph. I found out just how hard working and accurate Norb is when I assisted him. This truly a labor of love for him as he was totally helpful to all who came to our booth. I also enjoyed handling some of the finest equipment in the industry. Have you noticed how naturally our Trueflight Feather fletchings blend in on those "hunting scene" ads? Unlike dull looking plastic vanes, Trueflight Feathers seem to have a Natural Beauty which fits in perfectly with the outdoors, hunting, and the natural world. Trueflight employees work very hard to enhance that beauty. But as we all know there is more to feathers than just looking good. It's how they preform at the moment of truth nothing can beat their forgiving characteristics. I believe this is what attracts us to them. Higher arrow speeds with feathers isn't a bad thing, either. "Those fletchings sure are REALLY bright." This is what a lot of customers are going to be saying about our new Trueflight Bright StripesTM. They will virtually light up your arrows and attract customers to your arrow displays. Like our phase 3 barred feathers, the Bright StripesTM are also hand sorted for the best grade of "oil line". These will be the "best of the best", without a doubt, and will certainly attract attention to any arrow regardless of shaft type. On behalf of all of us at Trueflight we thank you for your continued loyalty to Trueflight Feathers. May God bless you all. [ Bob Link signature from past newsletter goes here ] Bob Link, V.P. Trueflight sells "Cut to Length" sections which are ideal for flu-flu arrows. Trueflight's "Cut to Length" are available on special order in bulk boxes of 1000, in 4 inch base length and in all of the colors and Trueflight BarredTM patterns. The "Cut to Length" are comparable in price 4 inch diecuts. Some colors of dyed feathers have a darker shade on one side than the other. How come? High quality feathers have a natural "oil line" typically about 3/4 inch wide just above the quill of the feather, predominately on the fibers of one side. This natural oil serves to lubricate and protect the feather from both wear and weather. Because of this oil, some dyes penetrate one side of the feather more or less readily than the other. It is possible to remove the oil, for an even dye shade, but this reduces the flexibility and durability of the feather. For this reason, we believe it is a bad idea to remove the oil line on archery feathers. Are "Trueflight BarredTM" REAL barred feathers? Trueflight BarredTM are real turkey feathers, but we have added the bars artificially. We know of no source of "Natural Barred" (the real ones!) in commercial quantities. For real Natural Barred, you need to shoot some wild turkeys! Do we recommend Straight, Offset, or Helical fletching? We do NOT recommend straight fletching on any archery arrow. Offset or Helical Fletching cause the arrow to rotate in flight. This is very important. Like the spin of a bullet shot from a rifled gun barrel, the spin of the arrow does 2 things: 1) It "averages out" any microscopic imperfections and asymmetries in the arrow so errors don't build up in one direction. 2) The spin (about 1200 rpm for a typical feather fletched arrow!) adds a gyroscopic stabilizing moment to the arrow as it flies down range. As a general starting point, offset usually works well on target arrows, while broadhead equipped arrows will likely benefit from the added spin of helical fletching. I'm shooting "X" bow and "Y" arrows. What size feathers should I use? In archery there are so many possible variations in equipment, shooting style, conditions, etc, that "One Size DOESN'T Fit All". Each individual set up must be carefully test shot by the individual shooter in as close to field conditions as practical, using the actual broadheads. The ideal starting point choosing and setting up equipment is the advise of an experienced local dealer. Our general guidelines are: three, 4 inch diecuts for well tuned compound bows with standard broadheads or three, 5 inch diecuts for longbows, recurves, extreme performance compounds, or extra wide heavy broadheads. But these are only "starting points" some set ups WILL require larger fletching, while some be ok with less. It is better to error on the side of too much guidance instead of too little. The "speed loss" at normal hunting ranges from using oversize feathers is negligible. Tony Dukes (and Trueflight Feathers!) with an African Hartebeest. ARROW Noise... or BOW Noise? We're all convinced that a quiet shooting bow is a good thing. But what about the noise of the arrow while it is in flight? Is arrow flight noise likely to alert an animal in time to allow a flinch or jump? 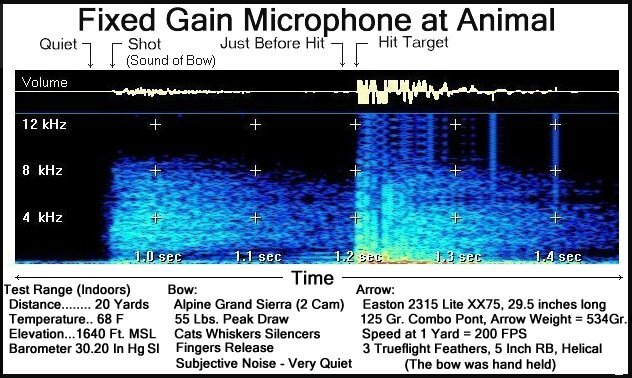 While bow noise has been well researched, we've found very little information on arrow noise. Ever willing to help fill an information gap and because we wanted to know our selves, we did some simple sound tests. We fed the recordings into an audio spectrum analyzer, which gave a good chart of both the volume of the sound as well as a break down of the strength at various frequencies. A typical chart is shown in the accompanying box, Figure 1. The one thing that immediately stands out in this chart is that the sound of the bow was quite loud at the 60 foot range while any sound from the arrow hardly shows up at all and then only a few milliseconds before the impact. The arrow flight noise shows up in the chart at the location labeled "Just Before Hit". The chart shown is typical of all recordings we made. With the same set up, repeated shots all looked (and sounded) very much the same. Our tests were very simple tests and we sure don't claim "laboratory accuracy" or that we have covered all possible variations in equipment, etc. However we believe that these results are a strong indication that the sound of the bow is likely to have far greater effect on an animal than the sound of the arrow in flight. The sound of the arrow in flight appears to be very much lower in volume than the bow sound, and was detected only milliseconds before impact. But IF a feather fletched arrow IS heard by an animal what is the reaction? Would you believe... we've heard very credible reports that a feather fletched arrow deliberately shot over the head of an animal results in reaction of curiosity, rather than alarm! It's reported that the animal looked up in the sky as though it was expecting to see a bird. One theory is that any sound from the feathers is mistaken for the very natural sound of a fast flying bird. We're not sure how to test this idea the sound of the bow is hard to eliminate, but we'd very much like to hear of any observations of animal reactions that you've made. Text and Photos copyright 2006, Trueflight Mfg. Co., Inc.